If the thought of jostling for space in crowded shops fills you with dread, we suggest spending an afternoon getting creative making presents from the comfort of your home instead. Our step-by-step guide to personalising kitchenware with letters and a touch of metallic paint is fun and easy to follow. 1 Using a computer word-processing program, select a font and size for your chosen initial, printing it on plain paper first to ensure you like it. Once you are happy, load printer with magic decal paper to print out the initial. 2 Carefully cut out the initial. Following the manufacturers’ instructions, soak the reverse of the initial with a sponge and then immerse in water. 3 Position the initial on the cup (or mug) and slide into place, removing any excess water. 4 Remove the top film and place the cup in the oven using the settings outlined in the manufacturers’ instructions. to pick up the top layer of film, leaving behind a glossy image. 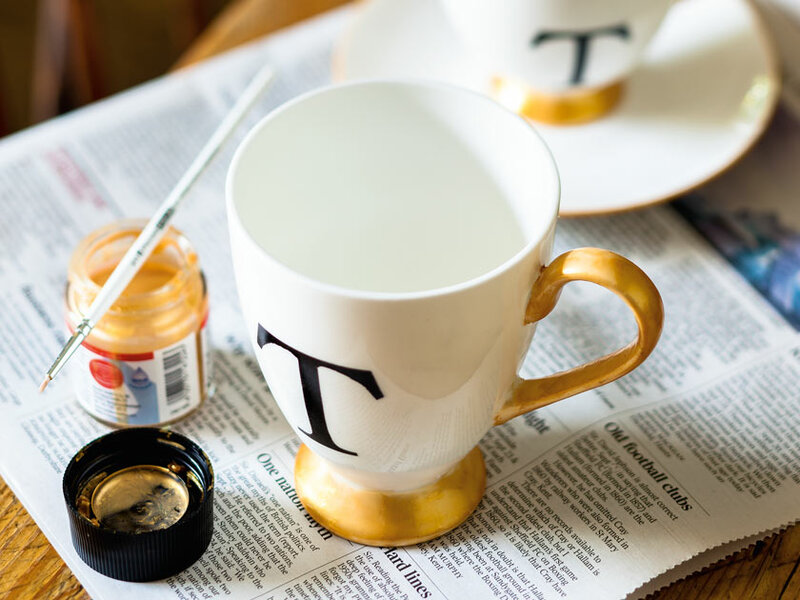 6 Use either a gold porcelain paint pen or gold paint to carefully gilt-edge the saucer. Repeat on the base and handle of the cup and mug. 7 The gold paint is self-fixing and dishwasher-safe after three days, so be sure to leave enough time to allow it to set.